Even in the rush hour at a handover station our AGV work with routine and endurance and ensure that the delivered pallets are transported quickly to a free slot in the warehouse. Read more about our fully automated coworkers on our special page. Innovative and industry leading forklift trucks. Quality used trucks. Unrivalled refurbishment process. Daily/weekly/monthly hire for events or peak periods. ISO 9001 and ISO 14001 certificates for all our trucks. Call for assistance on spare parts ordering. 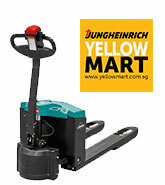 Jungheinrich offers complete intralogistics solutions. Automated Guided Vehicles (AGV), Warehouse Navigation, Warehouse Management System (WMS), system integration and more! Automated, semi-automated, or manual - we have the right solution for you. Make Jungheinrich your BestInvest and start your fuel and energy savings now. We offer exciting career opportunities with industry leading training.